Pure organic juice with just one ingredient: fresh oranges ripened to bursting sweetness under the Sicilian sun. Luscombe source their exceptional organic citrus from a family farm that dates all the way back to 1890; they really know their oranges! Naturally sweet and subtly citrussy, this juice is the ultimate accompaniment to a hearty breakfast. The juice may split in the bottle. Don’t worry – just give it a shake to make sure it’s fully mixed. Store in a cool place. Chill and tip twice to lift sediment and ensure the orange is fully mixed before serving. Once opened, refrigerate and drink within 5 days. 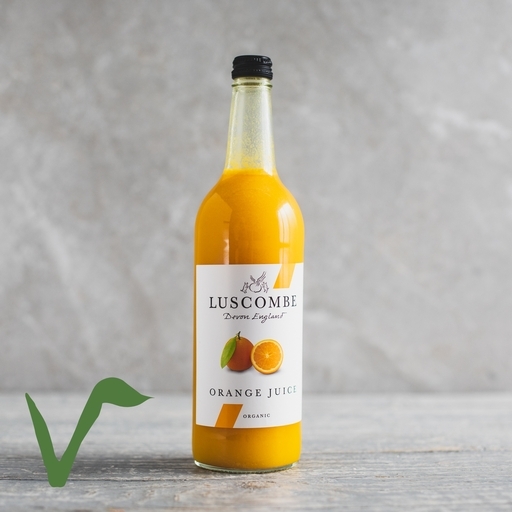 Luscome have been making juices and traditional soft drinks by hand in small batches since 1975, in the historic setting of Domesday Farm, Buckfastleigh (just down the road from our own Devon farm). Luscombe drinks are made using only the finest fresh ingredients, including elderflowers from our own fields.